A fascinating combination of a garnet gemstone as well as a diamond halo ensures that instant attraction is one of the key attributes of this cute ring. Its rounded shape fashioned from 925 sterling silver lends high emphasis to the gemstone sitting on the sterling silver base place on top of the ring. The upper half surface of the ring is amply decorated with embedded 0.11 Carat diamonds while the 2.60 Carat, cushion-cut, garnet gemstone is also surrounded by a halo of sharply radiating diamonds which enhance its own luster. Boasting of thirty-six diamonds all over and a gemstone measuring 8mm x 8mm, this ring is the picture of cuteness. 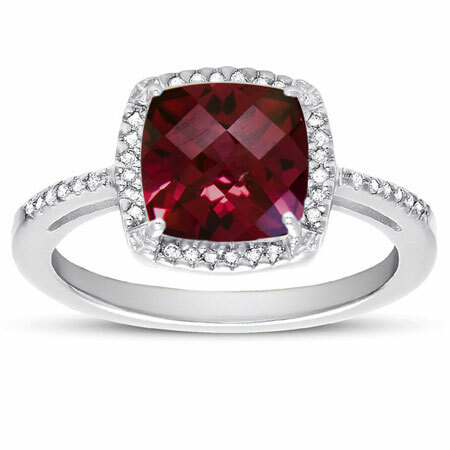 We guarantee our Checker-Board Cushion-Cut Garnet and Diamond Halo Ring in Sterling Silver to be high quality, authentic jewelry, as described above.